Am Currently Earning My Nursing Badge...Haha! Am just popping in to say that the reason I have been a little quiet recently and why no new stock has been listed to the website this past week or so, is because I have been dashing backwards and forwards between Thame and the West Country, undertaking a spot of "nursing" an elderly relative. Unfortunately where I have had to go, internet access is not brilliant and rather intermittent. And although I have my laptop with me, communication is proving a little tricky at times but will endeavour to catch up with you all properly when I get back, which will be in a day or so. Round The Back Of The Old Gardener's Cottage! Here is a video of our next workshop project, a unique and nostalgic scene of an old gardener's backyard. Everything you see in the video, we will be making including the old water carrier, old stone back wall, tiled overhang, poppy strewn grass verge, old console table, dilapidated post and wire fence, etc.! 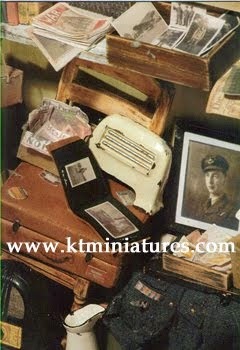 You can see the project here in 1/12th scale, however we are also offering this project in 1/24th scale too. just off Junction 9 of the M40. Loads of space, ample free parking and lots of other shops within the Bicester Avenue Home, Garden and Leisure Shopping Centre too! Booking has now opened but if you would like to come, please get in touch asap as spaces are already filling fast! 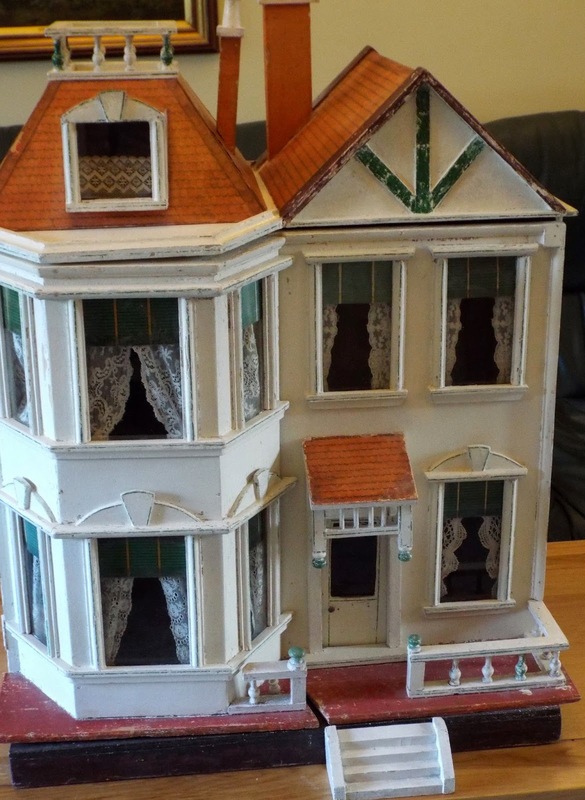 An Exquisite Rare G&J Lines No 18 Dolls House Just Gone Up For Sale Today....It Is Beautiful!!! 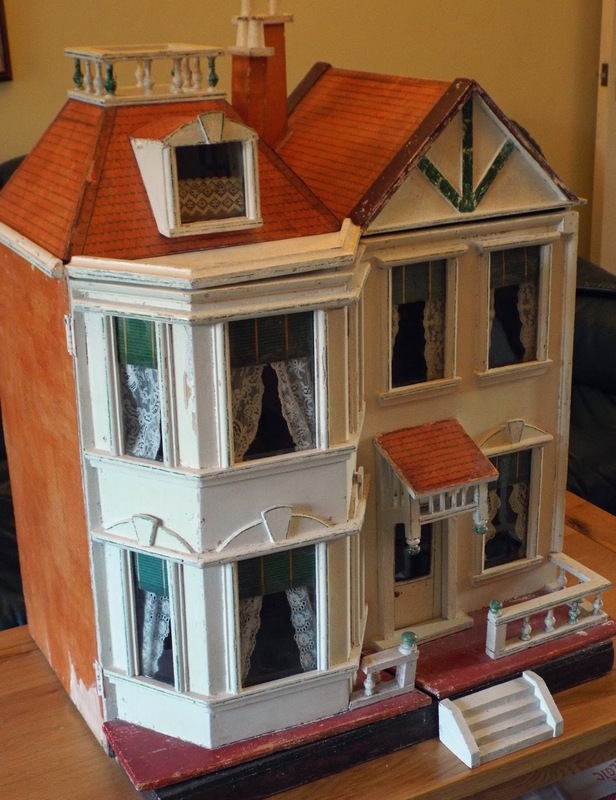 Now this is one dolls house that I SERIOUSLY have had great difficulty letting go of! It is beautiful and old treasures like this certainly do not come along very often. 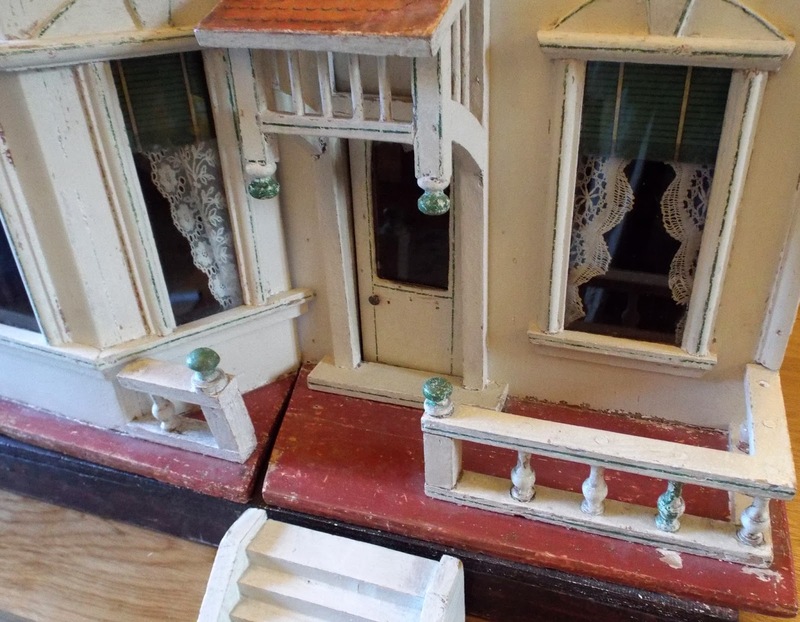 Today, I have just listed this gorgeous early 1900s G&J Lines No 18 dolls house. It is in wonderful condition! It is front opening and opens out into two halves. There are four big rooms, ceiling height of just under 10 1/2". The tiled lino flooring effect paper, I believe, is probably original. The brick flooring paper is not original. The wallpaper are replacements but they have been sympathetically and beautifully done. Also there are three wooden Lines fireplaces, which is nice.....these are so often lost. 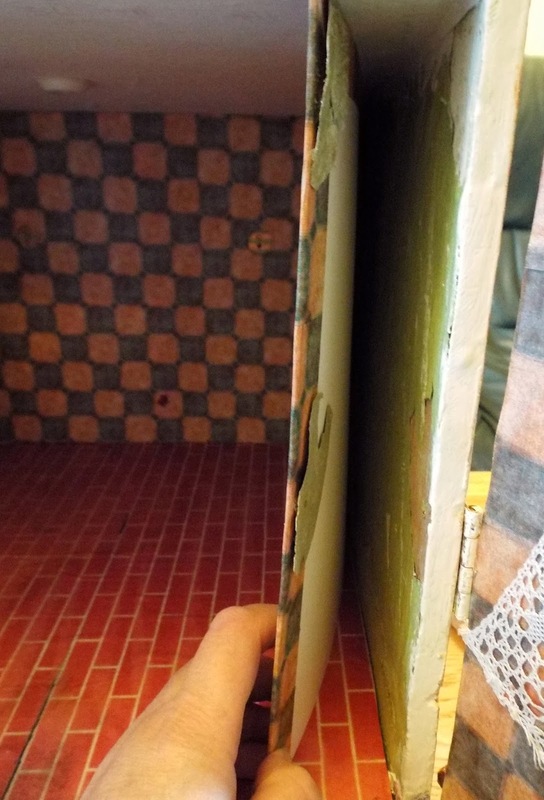 In fact, in the kitchen a mock card wall with matching reproduction paper, covers original green paper underneath....brilliant for research purposes. I wonder how many of us, left with just one wall of original paper, would have bothered to do this? A lesson to us all. The exterior is in completely original condition with the Lines brick paper on each side wall. The back has the remains of burgundy paint and a hint of the more modern electrics. 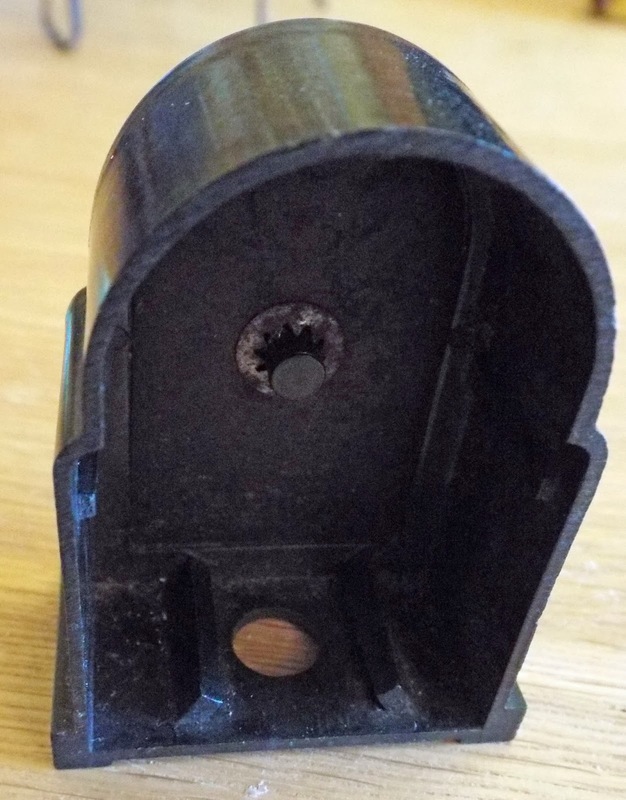 The little peg that pushes into a hole on the base of the left front ensures that the whole frontage stays in place. The windows are all glazed with real glass and the glazed front door opens. Old lace and reproduction mock paper blinds hang at the window. The blinds have been cleverly made and are very effective. The roof has the original Lines tiled paper. The left roof with the pretty widow's walk and glazed window lifts off so this is another little room that can be furnished. This house was much cherished by the previous owner but due to personal circumstances it had to go into storage and the hard decision to let it go was finally made. So now this house needs a new home - one where it will continue to be cherished and loved. What a beauty this is.......due to the size, weight and of course, sheer fragility, this needs to be collected from me here in Thame, in person. I am based just a couple of miles from the M40. 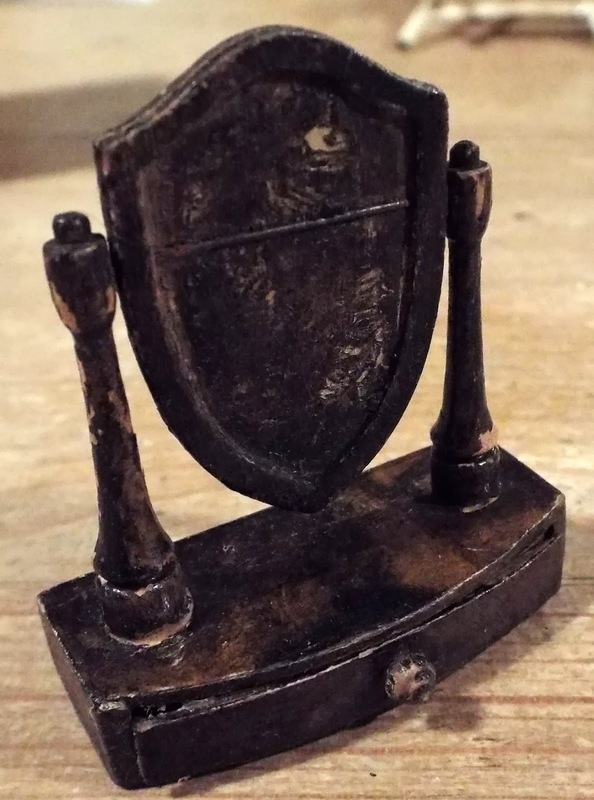 Overseas customers, this could be shipped by www.williamsandhill.com They are pricey but will do a good job and specialise in shipping big antique items. Some Old Miniature Bits & Bobs! 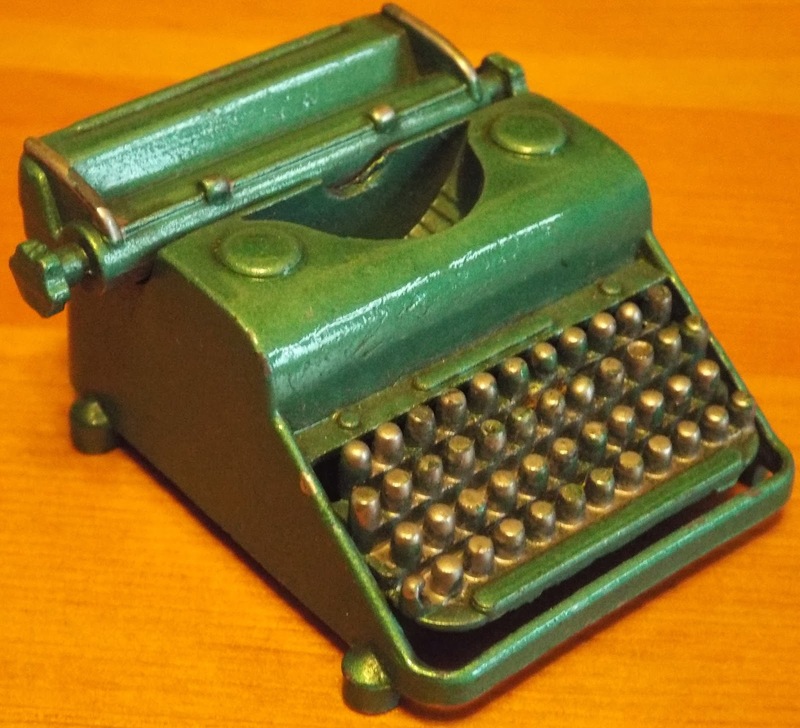 This 1950s BCM typewriter has caused a bit of a stir. It was only listed late yesterday but when I switched my computer on this morning, my inbox was full of requests from several people all wanting to order it! Needless to say the lucky person who was first in the inbox is purchasing it....sorry folks for all of you who have been disappointed! It is exquisite though and if you press hard on the buttons the paper holder moves to the left....fantastic. Plus it is in such a wonderful condition...has very little wear to the paintwork. 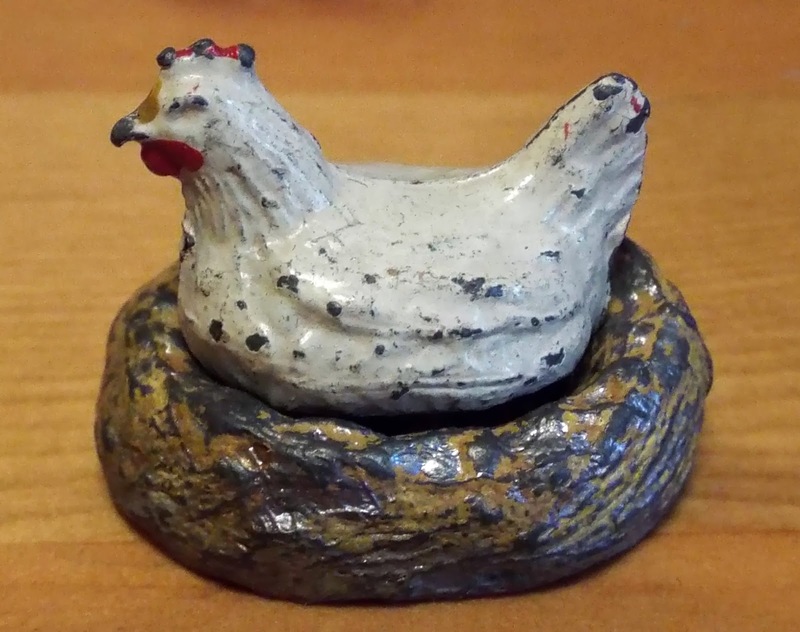 This is a bit of fun....a 1950s FGT & Son hen sitting on her nest, all painted pewter. Would look brilliant in the backyard of your vintage dolls house! 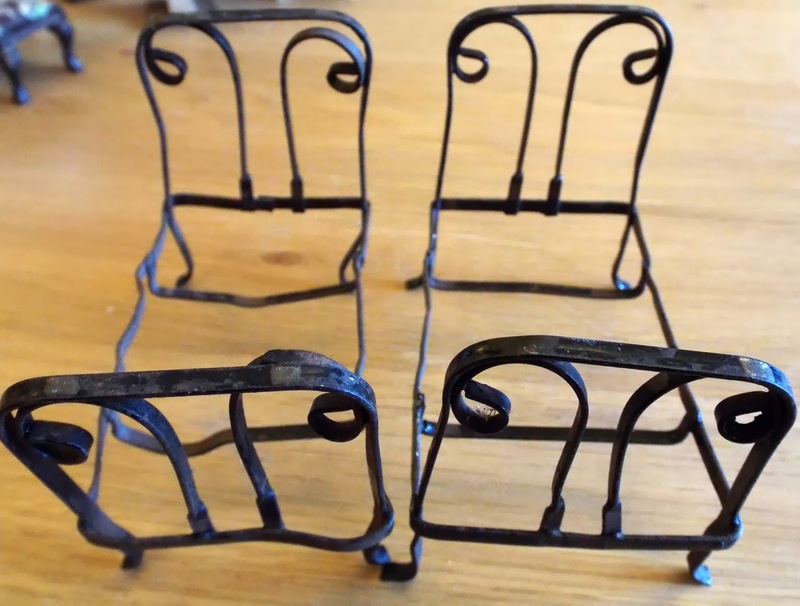 These early 1900s decorative bedsteads have been much played with and the metal may be a little bent in places but nothing that a sturdy pair of pliers could not straighten if you wished. Personally I love them like this as it gives them additional character! 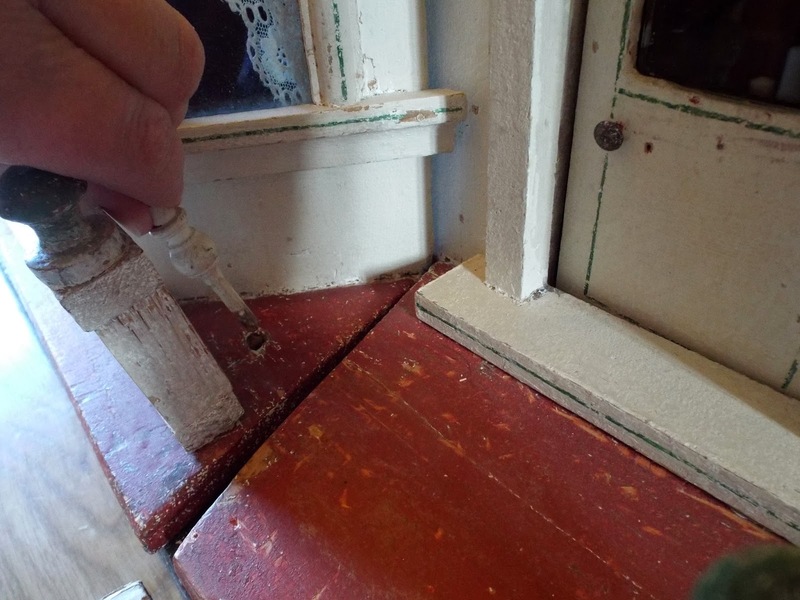 This 1930s Tri-ang dolls house mirror with drawer may be a little battered and missing it's actual mirror....but it simply does not come along very often. 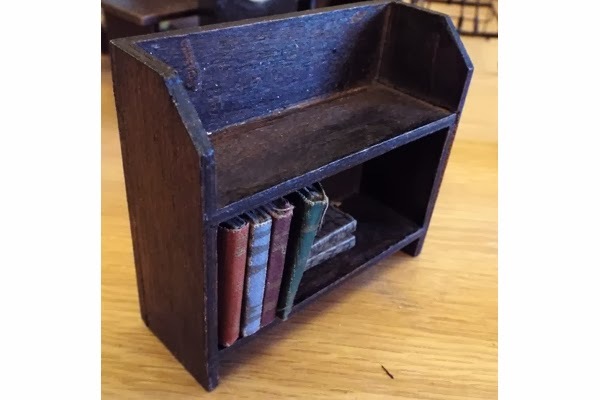 This dark varnished 1930s bookcase is super and comes with six vintage mock books. 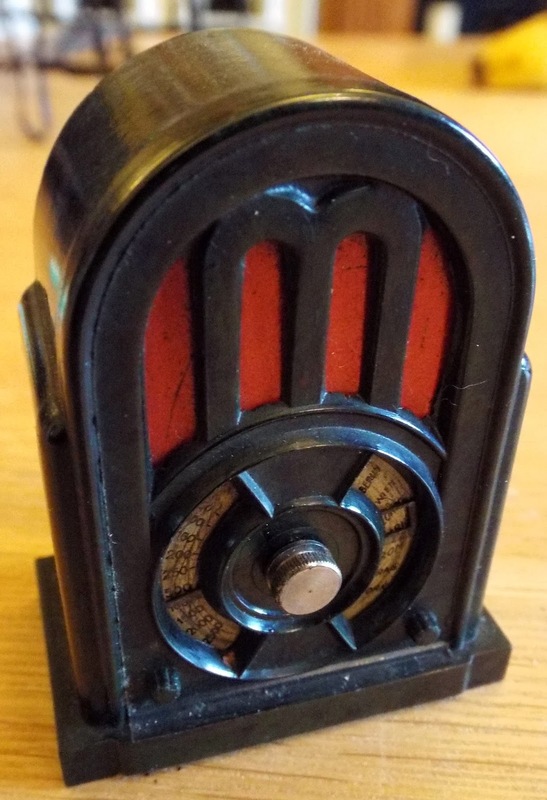 This German pre-war bakelite pencil sharpener in the shape of a wireless is perfect for an old dolls house. 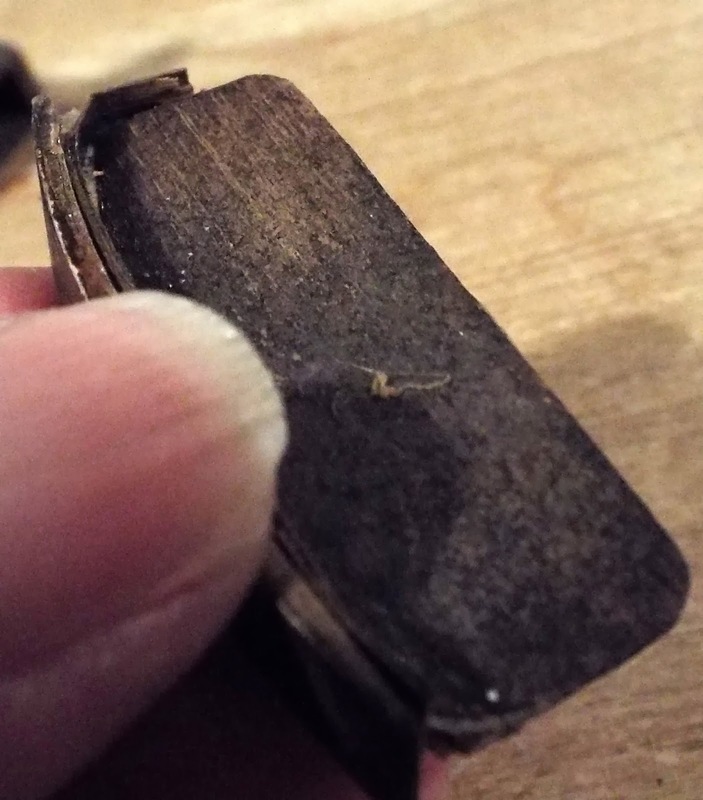 I have two currently in stock...one that is perfectly intact and this one that has just gone up for sale, that is missing its backplate and the pencil sharpening mechanism. 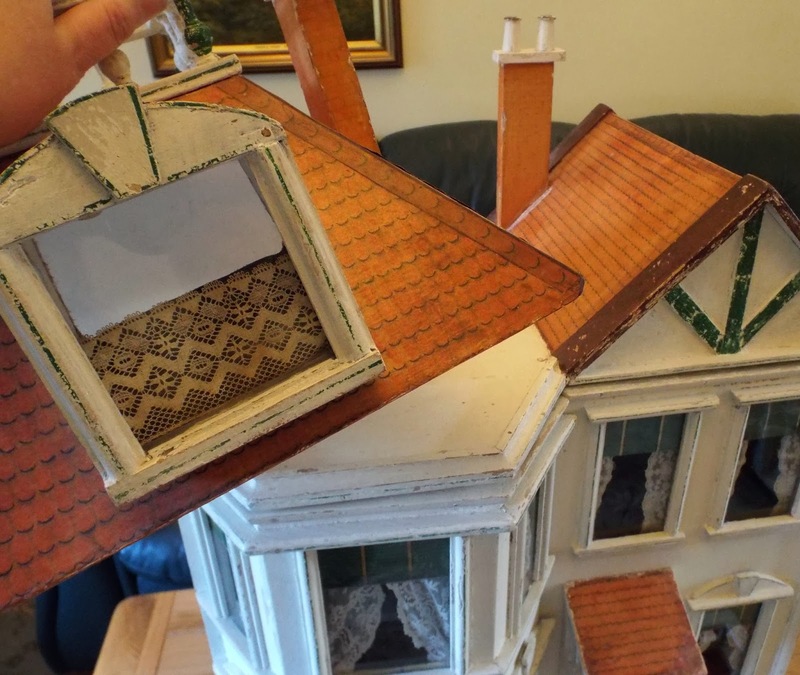 LAST CHANCE TO ENTER THE GIVEAWAY COMPETITION ON DOLLS HOUSES PAST & PRESENT WEBSITE! This is just a reminder that tomorrow, Sunday 19th January, the Giveaway Competition on the Dolls Houses Past & Present website will be closing. 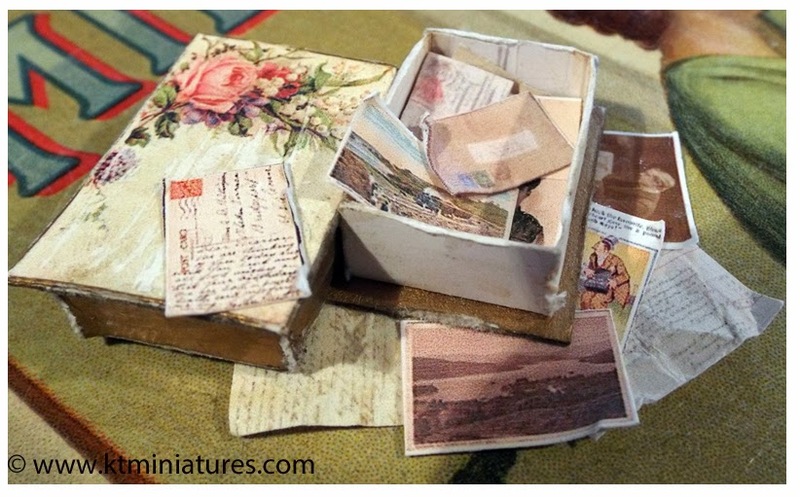 I am offering a prize of two of my handmade chocolate boxes filled with photos and letters etc.Please note that you need to be a member of the Dolls Houses Past & Present website to enter. Aaagh...am sure it will look nice when its finished! Hmmm.....it has only been 6 days since our ancient free standing cooker was taken away and our new cooker, hob and cooker hood arrived. Freddie, our youngest cat, is not happy to have his peaceful sleeping place disturbed! 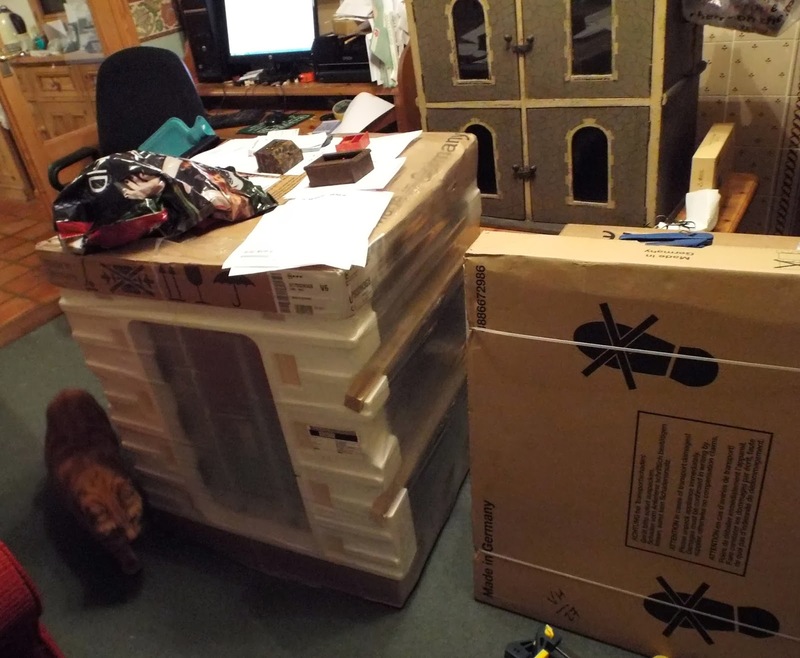 However, the new bits are still in boxes unpacked, all lined up in my "computer room". We have to climb over and around boxes in order for me to get to the computer!!! (Although the cooker is proving handy for laying out orders ready for despatch) lol!!! Where our old cooker once stood, is now just an empty space filled with rubble. 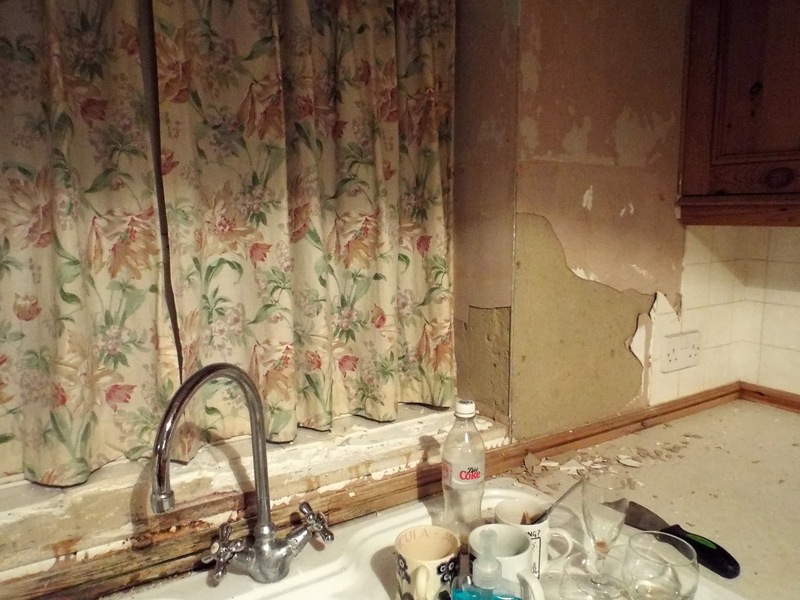 As we have been hacking off the tiles in readiness....unfortunately half the wall has been coming away too...grrr. The mess and dust is horrible and I feel my stress levels already rising. 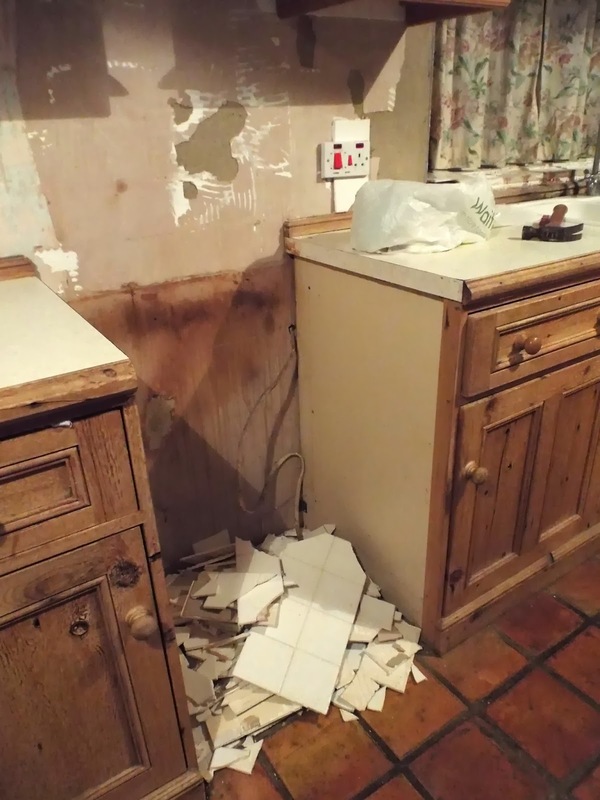 Mind you, it was not helped by our "ordered and fully paid for before Xmas worktops" to go awol in between Oxford and Thame these past few weeks!! However, finally after throwing my toys completely out of my pram on Friday afternoon to the manager, when yet again the promised delivery did not arrive....the long lost cocky and unapologetic driver materialised as if by magic at 7.30 on Friday night...in the dark! (I will NEVER order anything again from that well known DIY store that begins with "H"...no matter how many special discounts they are offering)!!!!! As our lovely guy "Phil" cannot start working on the kitchen until next Wednesday, it does mean that we have to continue cooking simply with a microwave for at least another week. Mr KT Miniatures is already sick of salads, baked potatoes plus the simply "prick the cellophane wrapper and heat in microwave" meals! However, I have to admit that I am becoming rather partial to the Waitrose Chicken & Cashew Nuts microwave meal!!! I have the unenviable task of emptying kitchen cupboards today - the contents of which will have to go in the lounge. We are keeping our 18 year old base/wall cupboards as we absolutely love them.....they were bespoke made from old pine reclaimed from a London factory roof and are still going strong all these years later, but the worktop has not lasted quite as well. Am sure it will all look nice when it is finished....however, meanwhile...it is business as usual and I have some rather lovely old treasures to list this coming week. 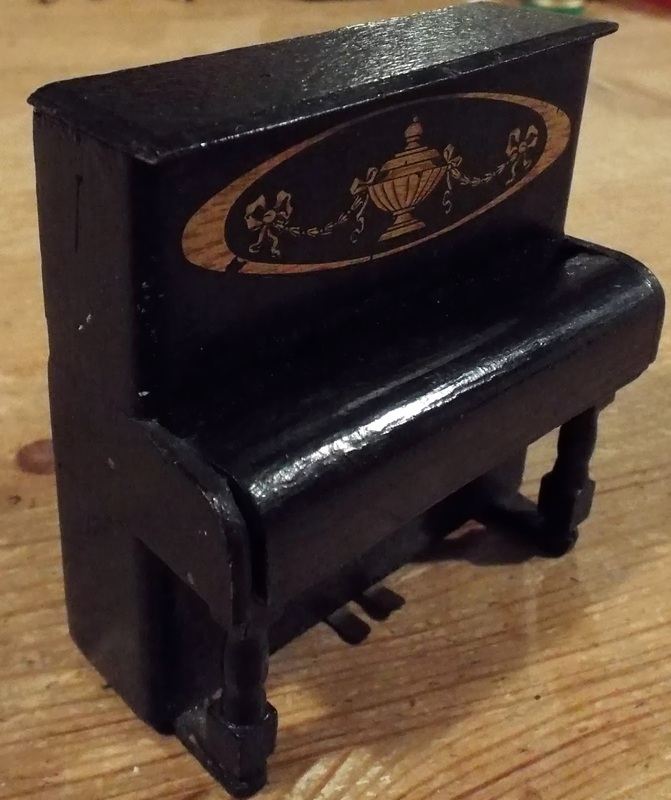 Some more lovely pieces of not just Pit-a-Pat dolls house furniture have come along this week but also some 1930s Tiny Toy furniture too. 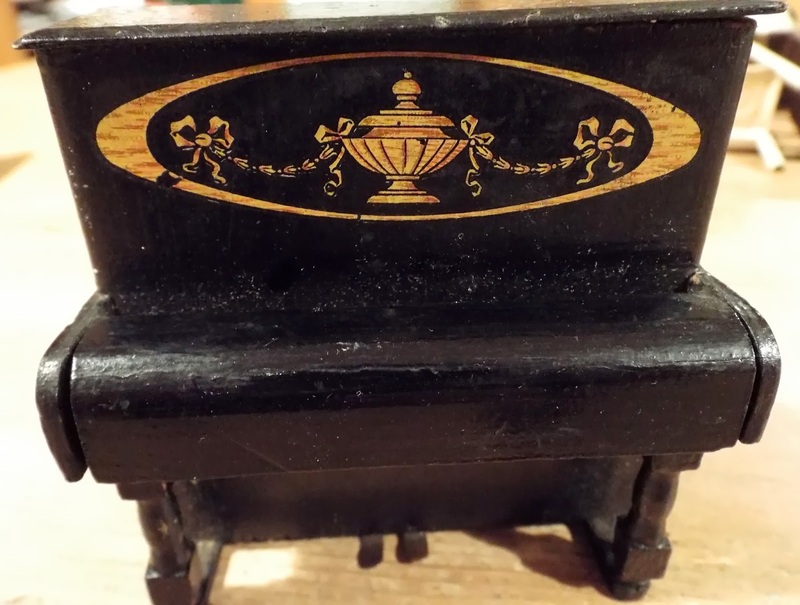 This rather nice wooden Pit-a-Pat piano in a black finish, is complete and in original condition. The very distinctive gold motif above the lid is extremely attractive. The two metal feet are still there-sometimes these are missing! 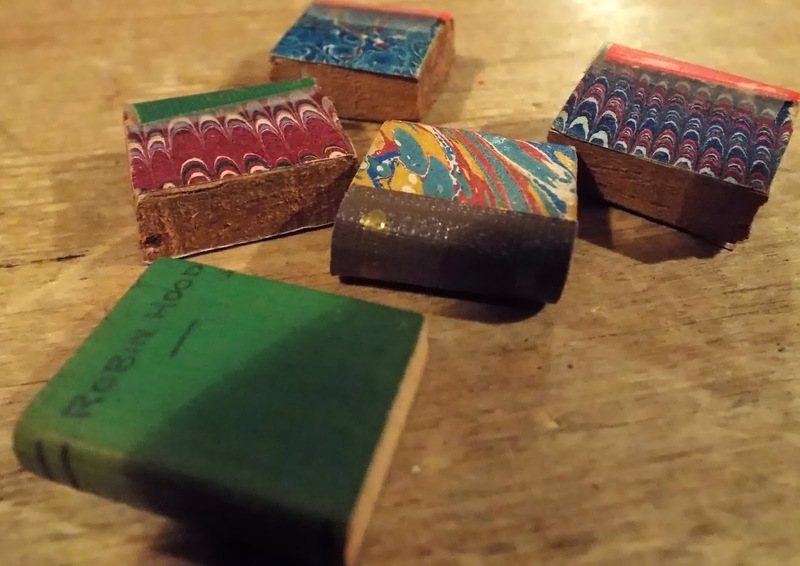 The lid lifts up to reveal the original paper keys. 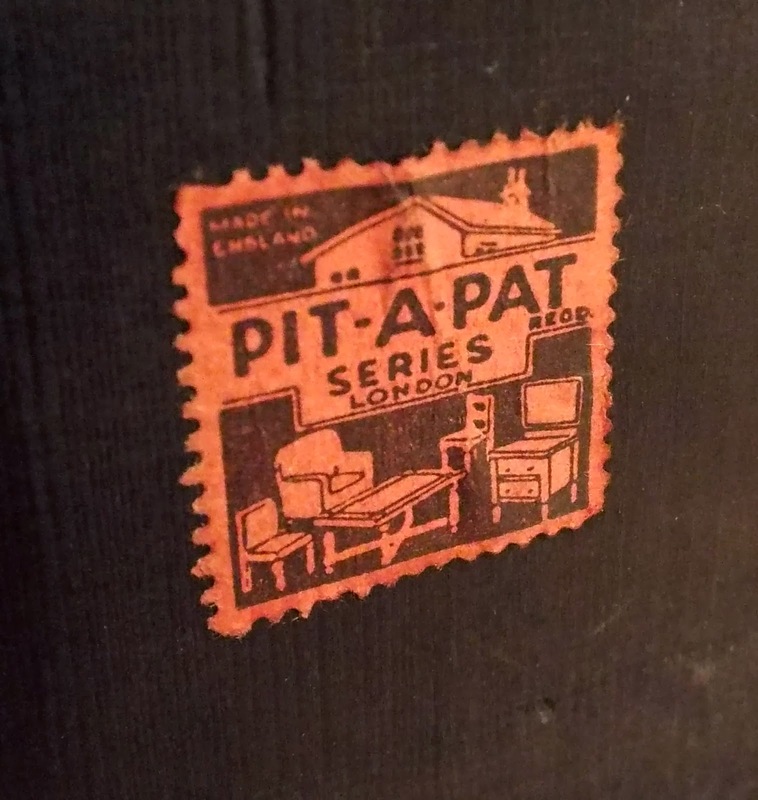 If you look carefully on the inside of the lid you can see in gold lettering the words "The Pit A Pat Piano Co. LONDON"
The red and black square Pit-a-Pat paper label is still on the back. 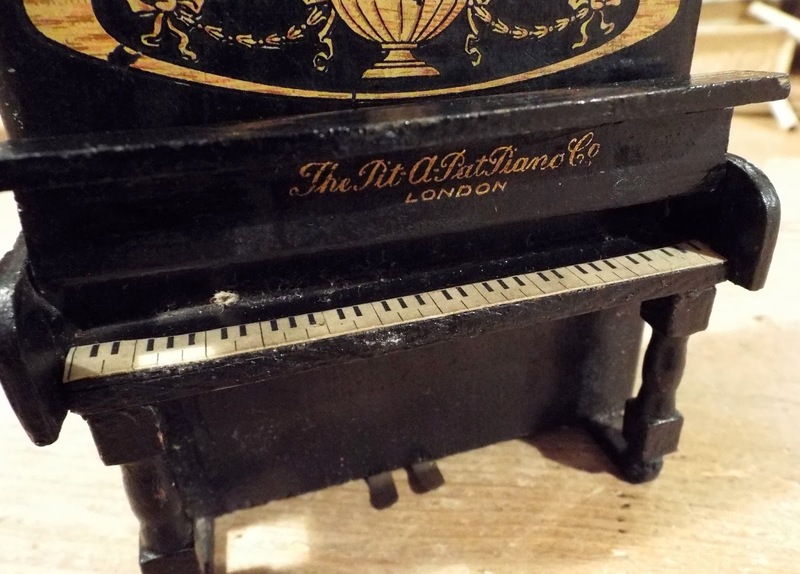 This piano is highly sought after and simple does not come along very often. Then there is this wooden wardrobe. Note the distinctive top beading which is found on many of the Pit-a-Pat items of furniture. The door of this wardrobe opens to reveal two hanging rails either side and two sliding hooks. From the same era are one or two Tiny Toy pieces, all with that instantly recognizable painted finish with mottled gold over the top! 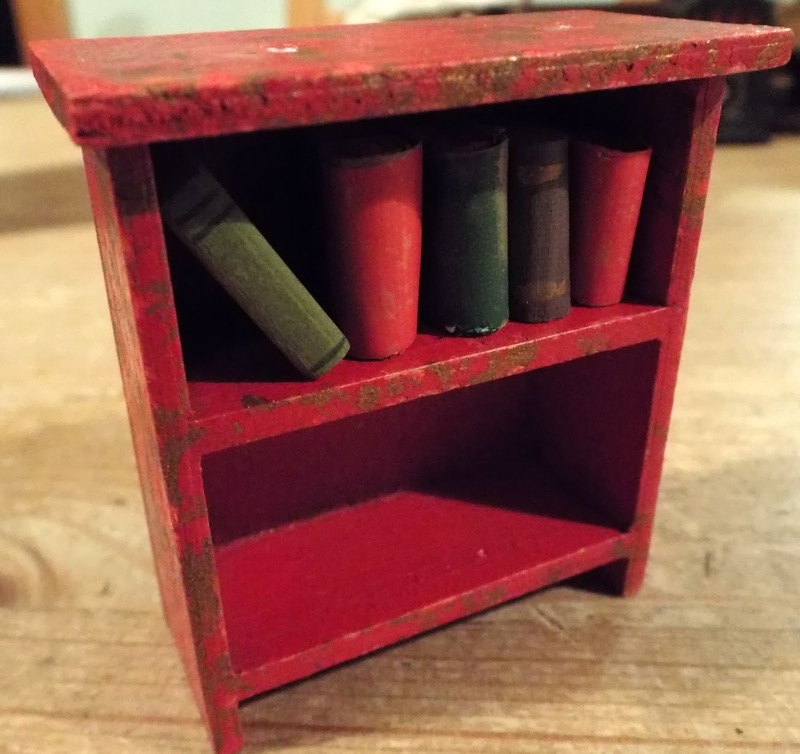 Here is a small bookcase, rather splendid in red and gold, along with five old imitation books. There are four books with pretty colourful covers and one green one that has written on the cover in Pencil in the most teeniest of neat writing....ROBIN HOOD! 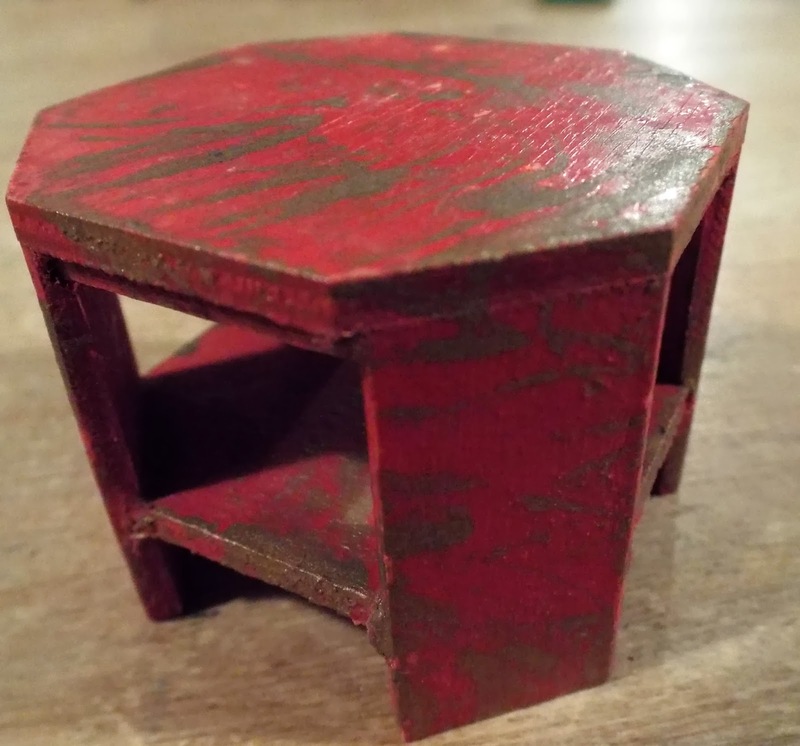 This hexagonal Tiny Toy occasional table with lower shelf, is so evocative of the 1930s! 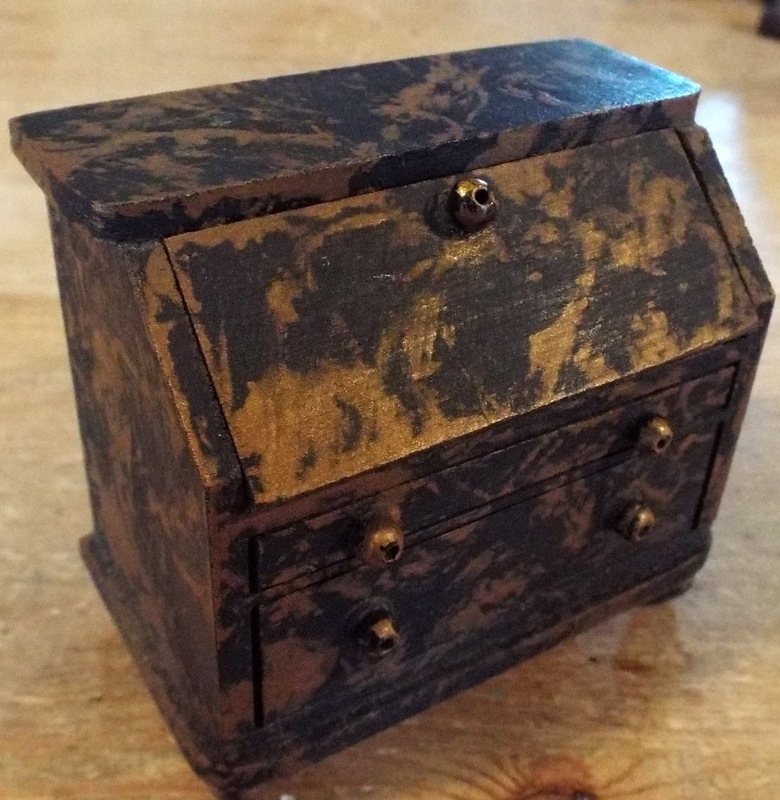 Finally, there is is handsome Tiny Toy bureau, this time in a black and gold finish. The flap drops down to reveal a writing area in a textured red material....maybe leather? Underneath there is a large drawer and a small drawer. 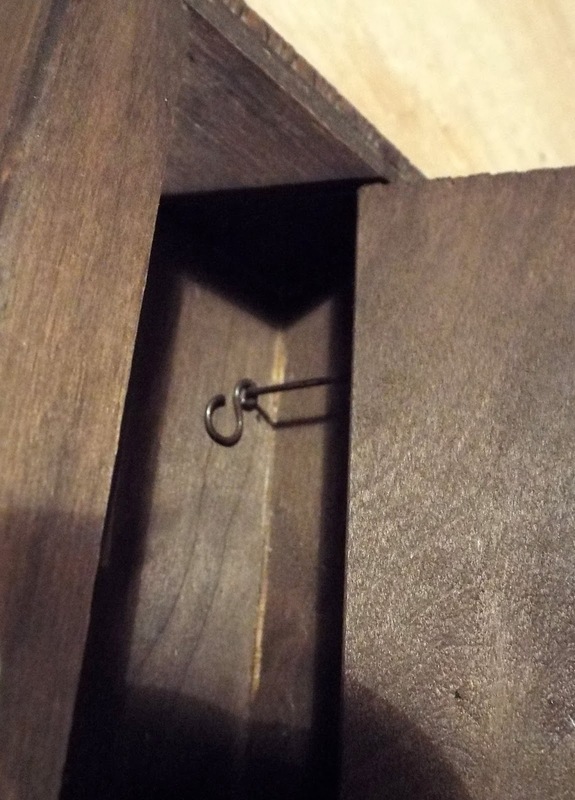 Like Pit-a-Pat furniture, the handles are beads. All these items above belonged to the original owner, who is now in her 80s and we would very much like these to go to a good home where they can continue to be cherished. 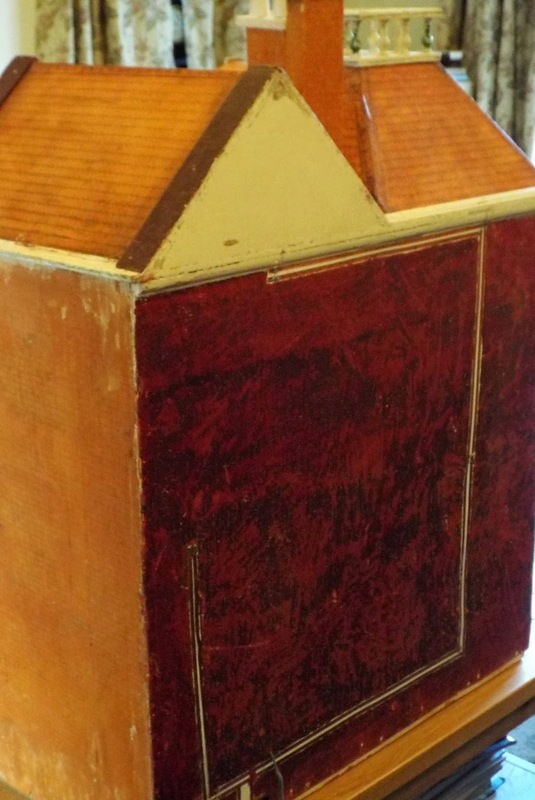 G&J Lines Dolls Houses- & Box Back Houses - Can You Help With Research? 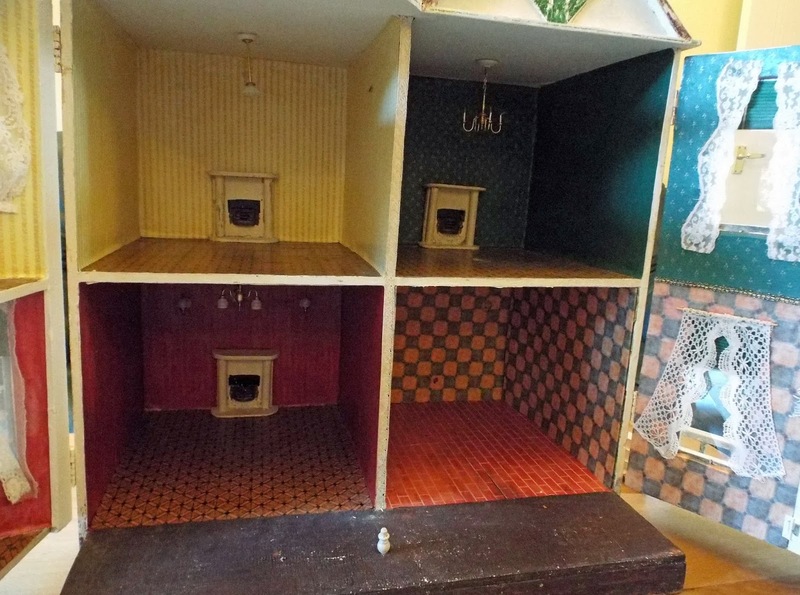 Do you have a G&J Lines dolls house or a box back dolls house tucked away at home? 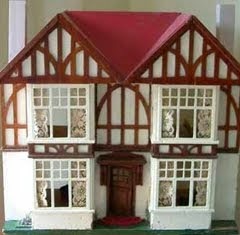 Or do you have a very old dolls house but have no idea if it is a G&J Lines dolls house or not? Then in that case, Marion Osborne would love to hear from you. 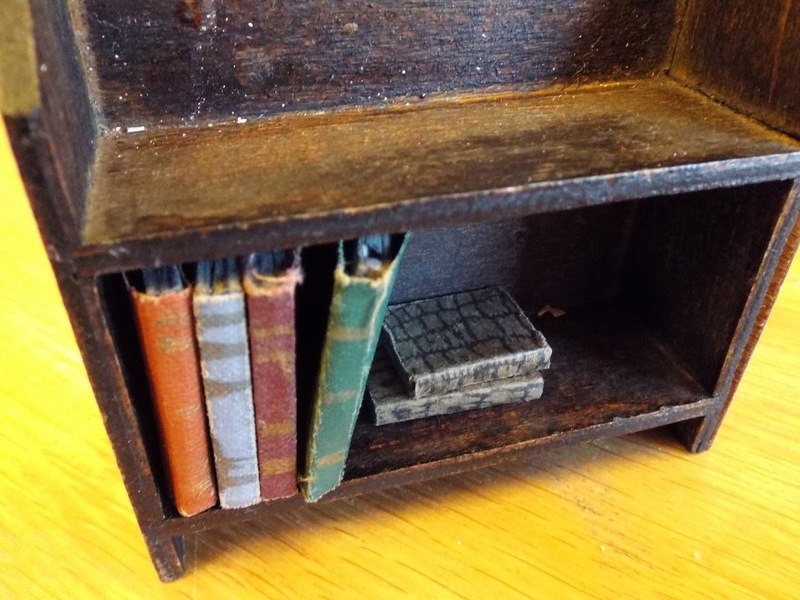 Please ask your readers if they have a Box Back and/or a G & J Lines dolls house in their collections. If they would care to send a photo of just the front of the house initially, then I would let them know what I know – if anything about the house itself and also if I need any other photos for the latest book. G & J Lines finished in 1931, very few of them have labels showing the Thistle, so if unsure then again, please send a photo. The Box Backs are so known as they do not have roofs on the house and the fronts are much higher than the house behind. Again if in doubt please do send me the photo and I will respond. Many thanks. Please don't be shy as Marion will be happy to hear from you. 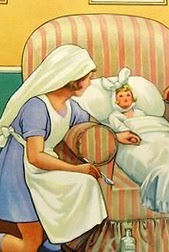 Not a lot is conclusively known about the very early G&J Lines dolls houses so it would be helpful if as much data as possible could be amassed of these elusive old treasures, so that a concise compilation of information can be made for the benefit of everyone and for generations to come. 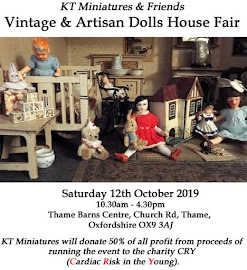 I shall be looking through my own files as I'm quite sure there must be a fair few G & J Lines houses of all shapes and sizes that have travelled through KT Miniatures over the years. Happy New Year & Welcome To 2014. 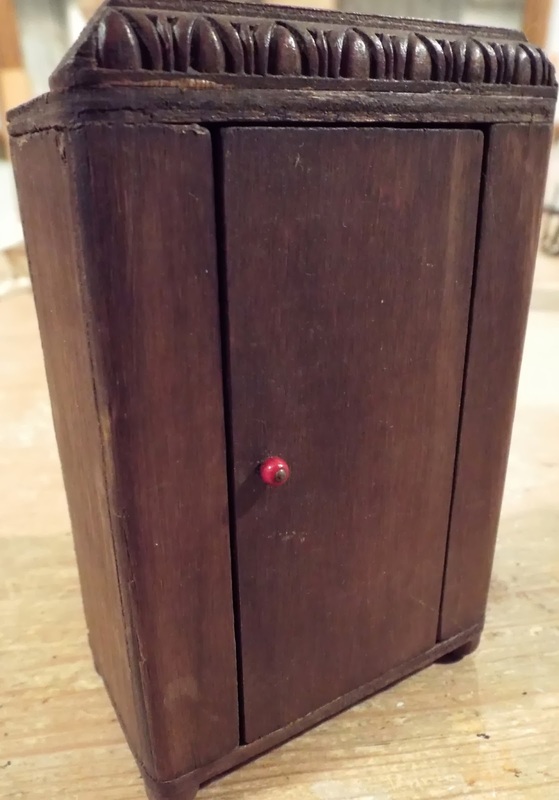 KT Miniatures Is Back Open For Business! Well ....2014 here we come! Hope you all had a fantastic time over the festive season...I certainly did and now can't quite believe that I'm about to embark on my 18th year of trading!! KT Miniatures is back open for business and am slowly working through the backlog of emails that came through during the Christmas and New Year holiday time. If you have not heard from me yet, you soon will as I'm now slowly clearing my inbox. The Tiny World Of KT Miniatures. The quarterly online magazine is free to all and the latest issue covers various fabulous topics such as Hobbies of Dereham: Dolls Houses Furniture & Fittings, How To Make A Rag Rug, The Eve Dawnay Collection, A Penny For A Dolls House....and lots more, including an interesting article from an innovative artist on Unpainting: Using A Doll's House As A Conceptual Art Work! Yes folks, I have donated two of my vintage style chocolate boxes in 1/12th scale....one filled with old photos and the other, with various vintage letters, postcards, photos etc. 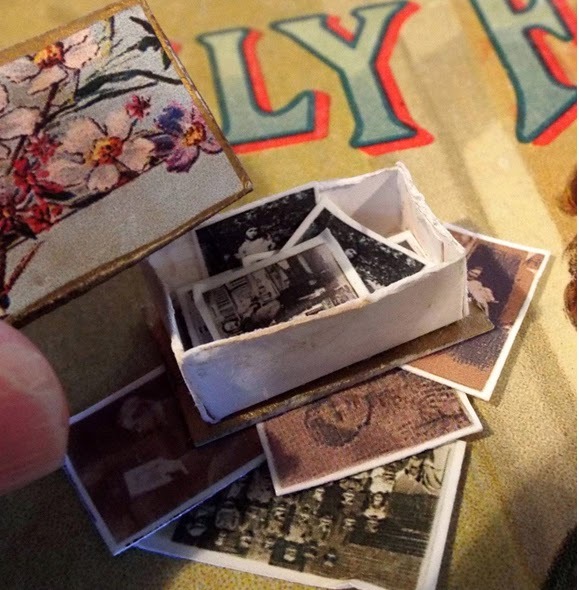 All items are fixed apart from the lid of the box that contains photos. Both these items are suitable to be used in modern reproduction dolls houses or vintage dolls houses. To enter, you will first need to ensure that you are a member of the Dolls Houses Past & Present Website. To join, you simply need to click on their "Members" link and you will find the relevant info at the top of that page. Rebecca Green is the editor of the magazine and owner of the website, she would love to hear from you. 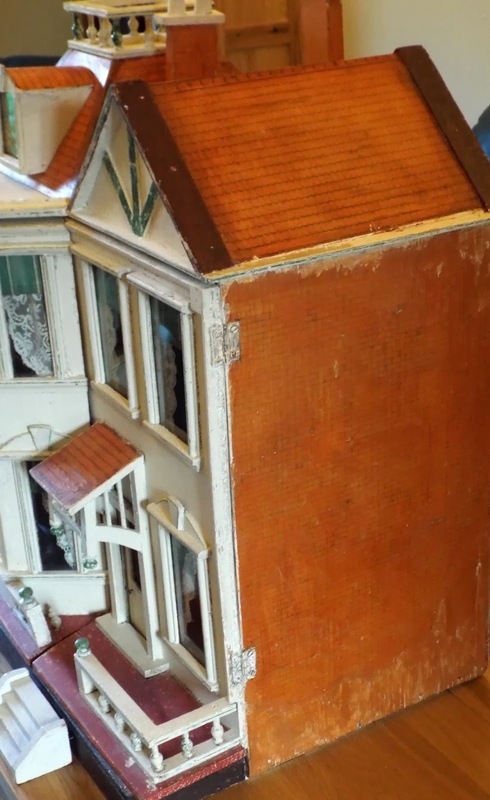 If you are not familiar with the website and a fan of old dolls houses particularly, then you will love this website. 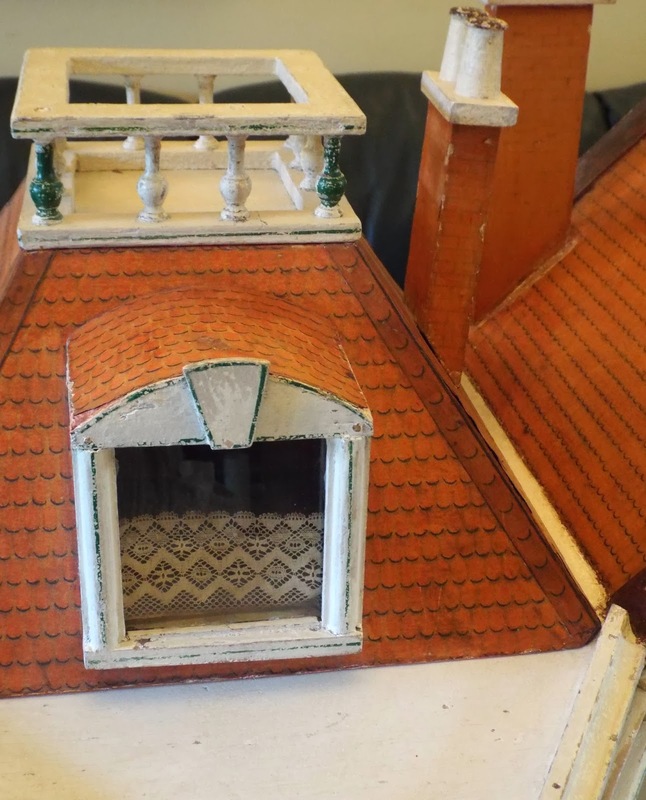 There are pages and pages of Gallery pictures of various old dolls houses and furniture belonging to members and more besides. 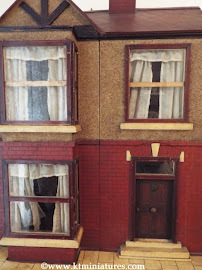 If you like to chat about dolls houses then there is a forum for members. Do go take a peek if you can!